There have been numerous encounters over the past seven years in my transracial adoption parenting journey where I've had to remind myself that I can't -- nor should I have to -- tackle adoptive, transracial parenting, or simply parenting, alone. When we started our first adoption journey, we definitely had a proverbial chip on our shoulders. It seemed like everywhere we turned, we were asked to prove ourselves, to justify our decisions, to be better and do more. As adoptive parents know, it starts with the adoption application. Filling out line after line of personal information, including character and employer references and motivation to adopt. Once accepted, we are fingerprinted, background checked, interviewed. We hand over financial statements, self-studies, and fire-escape plans. Parents who adopt domestically create a profile book filled with photos and paragraphs, all demonstrating that we are qualified to raise a child. Then you tell your family and friends you are adopting. The interrogations begin. The "prove yourself" demands only intensify once a match or referral occurs. The adoptive parents are on edge, at all times, uncertain of their future, terrified the placement won't happen, but equally as terrified that it will. After the child arrives, there are the post-placement visits, court dates, and often more paperwork. Everyone from your family doctor to the social security office employee demands information of you. And then, of course, there is the slew of questions about adoption, about your child's specific story, and about your motivation to choose adoption. Did you try to have "your own" child? What about surrogacy? Are your kids real siblings? Isn't adoption really expensive? Was the baby born drug-addicted? How old is the child's real mother? When our daughter was about six months old, my husband and I were in Target trying to buy a few birthday cards for relatives. Two black women walked up to us and said to me, "Your baby's hair is dry." I immediately felt my face flush with humiliation and anger. How dare these strangers judge our parenting and my precious child? Is their issue with the fact that we're white and our baby is black? One of the women, recognizing my defensiveness, said, "We go to a diverse church. Honey, we don't care what color you are. But that baby's hair is dry." Her friend nodded in agreement. The woman continued, ordering me to follow her. My husband and I looked at each other, both questioning what to do. I shrugged, grabbed the cart handle, and began forging ahead, following the two women. For the next thirty minutes, the two ladies showed us various lotions and hair products. We went from aisle to aisle, soaking in their knowledge and asking questions. They passed no judgment, like great teachers. Rather, they bestowed us with their wisdom, energy, and time. Two years later, I was having a bit of a personal adoption crisis. As my daughter got older and we prepared to adopt a second child, I was beginning to see how rampant racism was. The news was terrifying: story after story that broke my heart and unnerved me. The lack of books, movies, even greeting cards featuring people of color was disheartening. 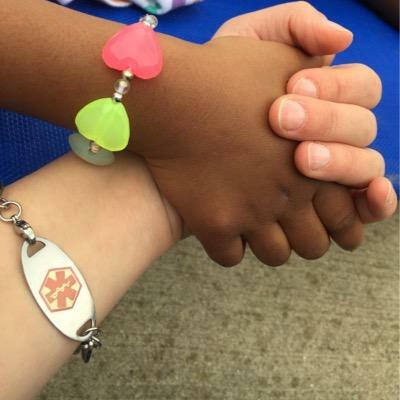 And the slew of questions and comments we faced as a transracial, adoptive family continued. I began to take everything to heart, and it all boiled down to a few key questions: Am I enough parent for my child? Is she going to be ok? One day after a weight-lifting class at my local gym, I went up to a woman with whom I had exercised alongside for over a year. Ann was in her sixties, a grandmother of one, and someone who was full of quiet strength. I asked her if she would be interested in going to dinner with me one night and held my breath to see what she would say. She smiled and accepted. A few weeks later, we settled into our seats at a local café and with my heart pounding, tears threatening to pour out of my eyes at any moment, I shared my fears. Ann, with all her grace and experience, told me all about herself: her parents, how, as a teenager, she went to an almost all-white school, her own children. We talked for well over an hour. At one point, she looked me right in the eyes and said, "Your children will be ok. You are a loving, caring mother. You are working so hard to do the right things." Just this past spring, my husband and I, along with our three young children, went to the fabric store to get the items necessary to make homemade birth banners. It wasn't going well. My oldest was pouting and tired; my middle daughter was dragging her feet dramatically while touching every single item on the shelves; and my son was howling because his bottle emptied too quickly. I was sweaty and flustered, and my husband was frantically putting back all the ribbons our son had plucked off the shelves. We took our place in the checkout lane when a family stepped in behind us. I could sense their lingering stares and braced myself. The woman said, "What a beautiful family you have! All of my children are adopted. They are all adults now." Next to her were her husband and one of her children, both of them beaming at us. "Thank you," I said, relieved that the encounter was simple and kind. Our turn came to check out and as I attempted to place all of our items on the counter and find my coupon, the kids grew increasingly bored and loud. I gave my husband "the look," and he took the children out of the store and to the car. As I returned to my task, I worried that the cashier would think my children were undisciplined and spoiled, when really, we had spent the weekend with the grandparents and the kids (and us) were simply exhausted. The cashier, an older black woman, looked deep into my eyes and said, "Patience, sister." Her simple affirmation and encouragement was incredibly moving. And once again, I was thankful that her response to seeing our family was to offer heartfelt advice rather than hasty assumptions in the form of a look, comment, or question. Adoption alone can be complicated, and it's always bittersweet. But compound adoption with transracial parenting, open adoption, and parenting multiple adoptees, and life gets a bit overwhelming at times. Seemingly, the media, the public, and even our own family members and friends, can sometimes work against us, creating a constant, low-level of anxiety in adoptive families. There have many days when I've chosen to fight adoption battles alone. I'm a type A lady: organized, determined, persistent, relentless, passionate. Asking for help isn't one of my strengths. As a former college teacher, I had no tolerance for excuses. I'm a pull-yourself-up-by-your-bootstraps kind of girl. But going at it alone hardly ever works. I guess that why someone wise once noted that "It takes a village." There have been numerous encounters over the past seven years in my transracial adoption parenting journey where I've had to remind myself that I can't -- nor should I have to -- tackle adoptive, transracial parenting, or simply parenting, alone. Parenting is often quite messy. I'm not meant to be, nor am I equipped to be, my children's one-and-only. There are wise, caring, and experienced people out there, in particular, Black women who are mothers, grandmothers, and aunts. They speak truth, exude wisdom, and offer hope. There is my girl's mentor, the young woman who for three years has poured energy, and time, and confidence into my daughters. There's the girls' hair braider, a mother and entrepreneur who nurtures my daughters while making their hair beautiful (while also mentoring me). C.S. Lewis said, "True humility is not thinking less of yourself; it is thinking of yourself less." Nothing has taught me how to be more confident, and simultaneously more humble, than adopting my children. And listening to and learning from Black women has been such an honor and a privilege, one that I'm thankful for every day.